The primary focus of this release was speed and scalability. 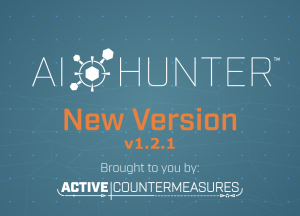 You should notice that screens run faster and AI-Hunter can process even larger datasets and whitelists. We’ve also reduced the size of the install file by a bit over 25%. We’ve also added a new module called “useragent”. This allows you to quickly identify unique user agents on your network, which may be an indication of systems running unexpected software. The most interesting user agents will automatically show up at the top of the list. You can find more info in the release announcement posted here.